As you may (or may not) know, my hubby draws comics. Not Spider-Man style, Calvin and Hobbes style. He also writes and illustrates picture books (written for adults but kids also enjoy them). Selling his books is how we make most of our living. As a side business, he also does book layouts for people (taking the word document and/or illustrations and getting it/them ready for the printer). Anyway, today’s pictures are all about his drawings. A little back story first, though. The way he sells enough books for us to live off of is by going into locally owned grocery stores and doing a “book signing.” Basically, he sets up a table and some books and sells them girl-scout-cookie style. 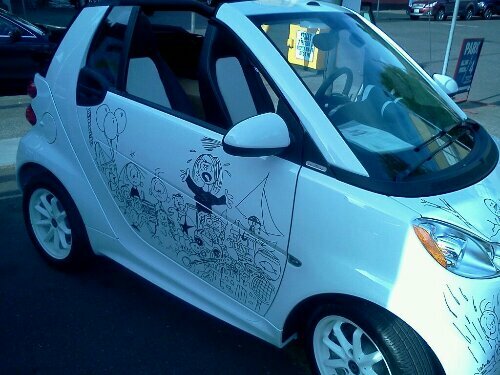 Back in December, a rep from Smart Car bought one. 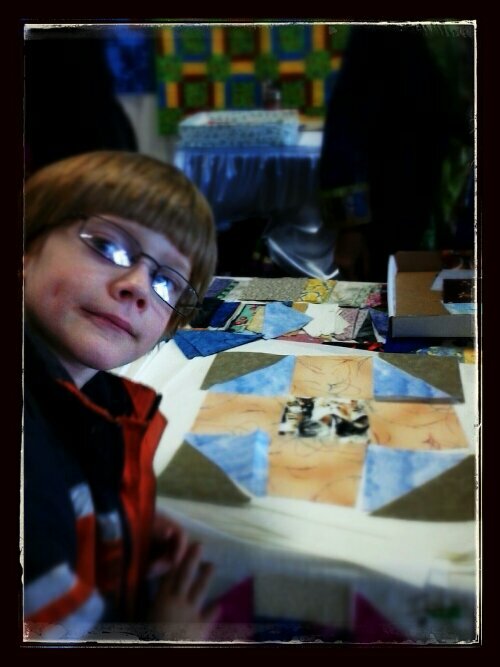 About a month ago, he (the rep) emailed hubby inviting him to be part of the “Art Your Smart” event in Portland. 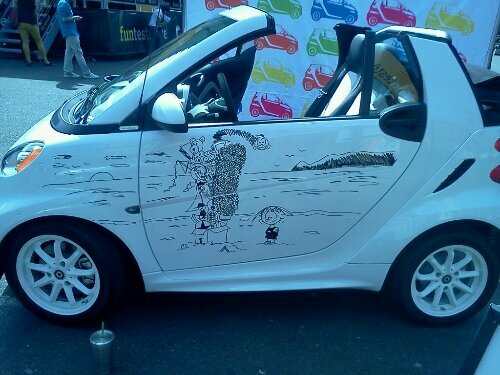 Basically, hubby gets to spend the day (yesterday and today) drawing all over a Smart car white-board style. Warning: DO NOT TRY THIS on a regular car. 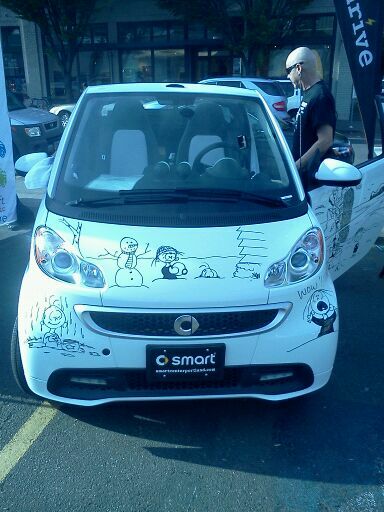 White Smart cars are made out of a material that will dry erase with expo markers. Regular cars are not. 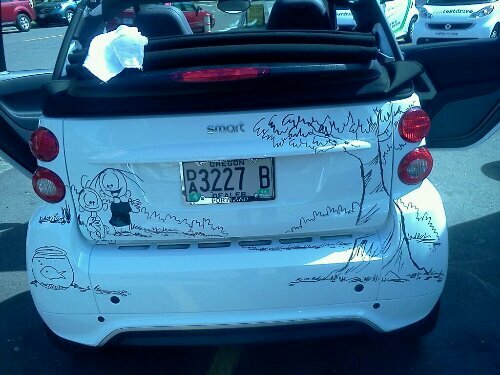 I take no liability for any drawn-on cars. Have a blessed weekend! And Happy Cinco de Mayo for any who celebrate it :). Finish 2nd grade math with Munchkin. 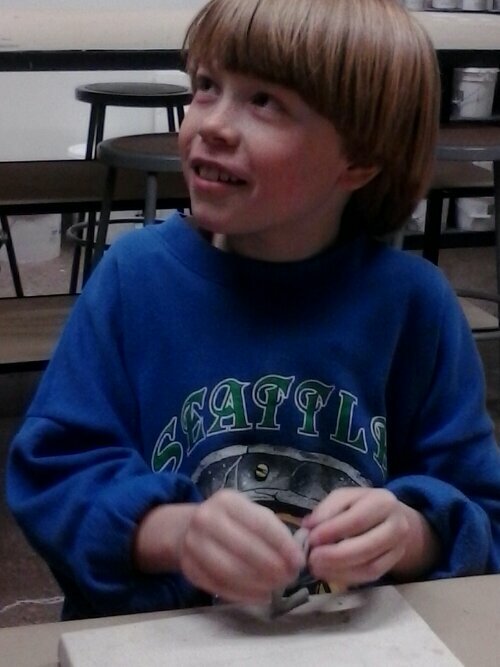 Make sure Seahawk is prepared for his 3rd grade standardized test. Work hard to limit our waste output by shopping in bulk using cloth bags or jars in lieu of the plastic baggies the stores provide. 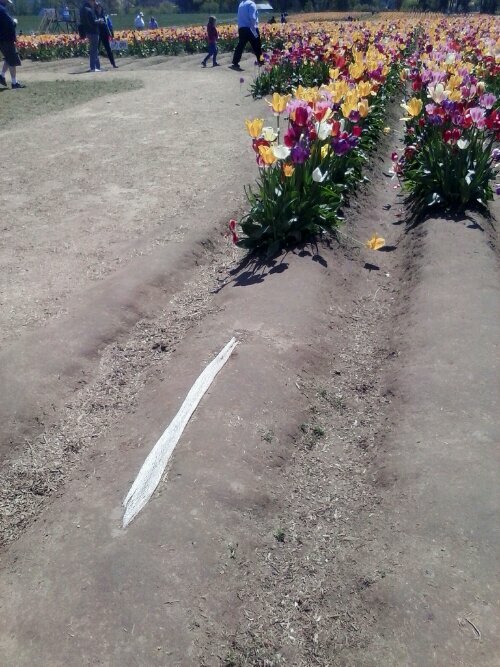 Finish weeding the flower beds (they’re pretty bad…) and plant flowers and/or vegetables there. 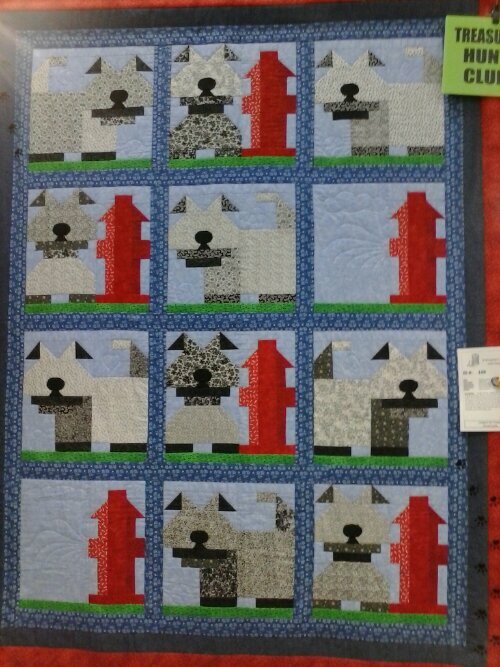 Repair or replace sewing machine (it won’t turn on anymore :() and continue work on my “Sunbonnet Sue Through the Year” quilt. Take the kids out for a walk at least once per day. That should do :). Do you have any goals for the month? Share them here! 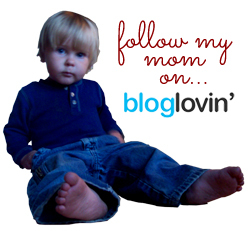 Accountability is a big motivator, and at the end of the month, we can chat about how we did. I’m a big fan of Stephenie Meyer’s works. If you read my about page, you’ll know that I used to write Twilight fan fiction; you don’t do that unless you’re a fan of the original work! As much as I liked Twilight (my obsession – and it really was that at one point – has waned greatly, which is why I used the past tense there), I thought The Host was a much superior story. 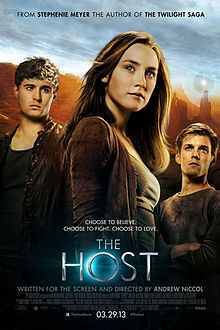 I’ve said more than once, when asked which I liked better, “The Host is a better story; it just has less memorable characters.” And I truly mean that. Melanie and Wanda and Jared and Ian are great, but they just don’t have the staying power of Edward and Bella. I can’t really explain why, either; I think they’re better characters, just less memorable. In case you don’t know the premise, it’s been said that The Host is a less gruesome, romantic version of Invasion of the Body Snatchers. I’m not familiar with that movie, but based on its title alone, I’d say that’s probably pretty accurate. A group of aliens, called Souls, have come to Earth. The catch is that they can’t live on their own (except for inside the special transport containers); they must have a host body. Most of Earth’s population has succumbed to the Souls, but there is a pocket of people who are still human. Melanie Stryder is one. The film opens with Melanie’s capture. She attempts suicide (there’s another suicide later in the movie as well, which contribute to its PG13 rating), but is rescued by the Souls and healed. An old soul called Wanderer (given this name because she’s been hosted by creatures in several planets) is placed in Melanie’s body. The trick is that Melanie is too strong to relinquish control. What the story amounts to is Mrs. Meyer’s go-to: a love triangle of supernatural proportions. Instead of vampires and werewolves, this time it’s two minds in one body, both in love with the same man (Wanderer falls in love with Jared, Melanie’s boyfriend, thanks to Melanie’s memories). I’m going to leave my synopsis there so as not to spoil the whole thing for you, should you decide to go see it. Compared to the book, I think the movie did a fine job. Some of the scenes I would’ve like to have seen weren’t there; looking back, though, I honestly don’t know how they would’ve done them without it becoming silly looking, so I forgive the filmmakers for leaving them out (lol). The makeup artist did an amazing job making Melanie/Wanda look dehydrated and nearly dead out in the Arizona desert. The special effects team did a great job with the mirrors that reflect light down, allowing wheat to grow in the depths of a cave. The actors were fine; I don’t think they made or broke the film. The props were not at all what I imagined while reading the book, and yet upon watching the movie, they were completely natural in the setting. The cars with the mirror paint jobs were pretty cool. Those were some of my favorite things in the movie, as well as my main critique. Oh, and in case you’re wondering, the scenes I wish they’d included but understand why they didn’t are Wanderer’s descriptions of the other planets she’s lived on. Great imagery in those pages. Overall, I give this movie a B+. Or 4 stars (on a 5 star scale). Whichever you prefer. Have you seen The Host? Do you plan to? Or read the book? I’m interested in your thoughts; leave them in the comments below :). We love bagels at my house. On Sunday mornings before church, I make breakfast sandwiches – egg, cheese, and bacon on a bagel. Yum! We used to buy them from a local coffee shop, but they got a new owner who raised the prices (drastically) and lowered the quality. So I figured out how to make them at home instead. 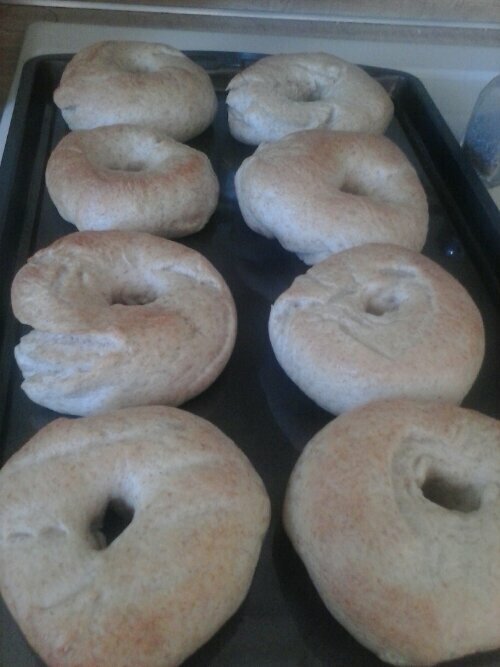 Until this week, I’ve been buying the bagels, but a couple weeks ago there was an article about bagels in the local newspaper, which was accompanied by a recipe. I’d been meaning to try it, but never remembered until it was too late on Saturday night. Well, this week, I remembered on Saturday morning! Let it rise for an hour until doubled in size. 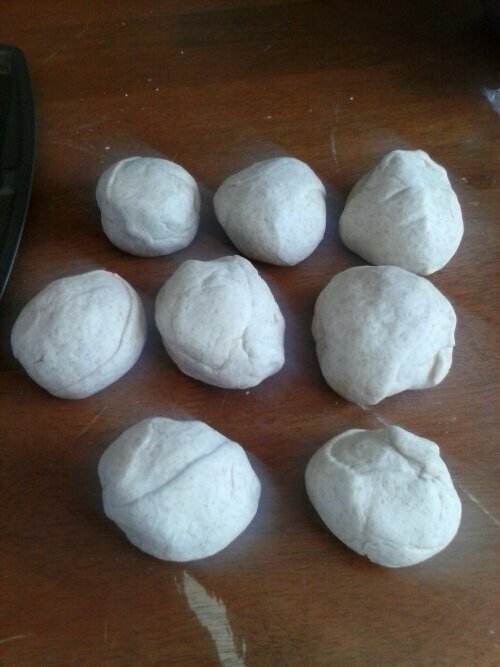 Divide the dough into 8 pieces and shape into balls. 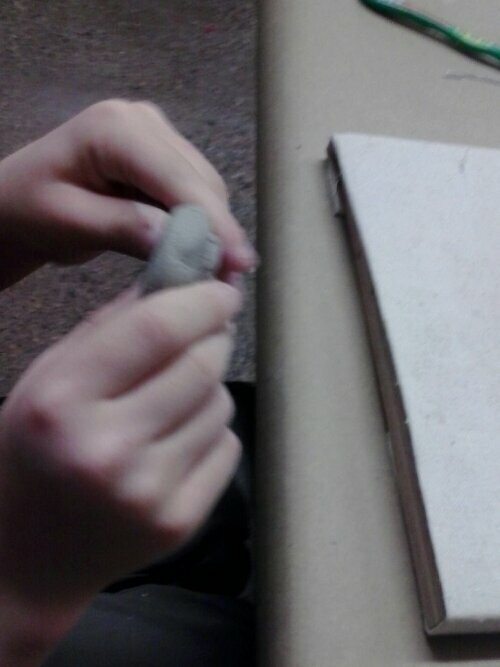 Using your finger, create a hole in each dough ball. Let the bagels rest for 10 minutes. 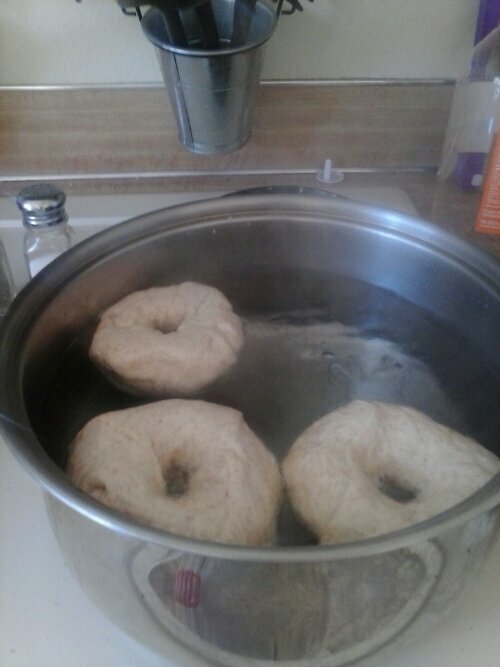 Boil the bagels. This is the step that turns “bagel shaped bread” into bagels. I hope you enjoy making – and eating – your own bagels as much as I did! In a small bowl, add 1/2 cup warm water. Pour in sugar and yeast but do not stir. Let sit for 5 minutes, then stir to dissolve. In a large bowl, combine flour and salt. Make a well in the center and pour in the yeast/sugar mixture. 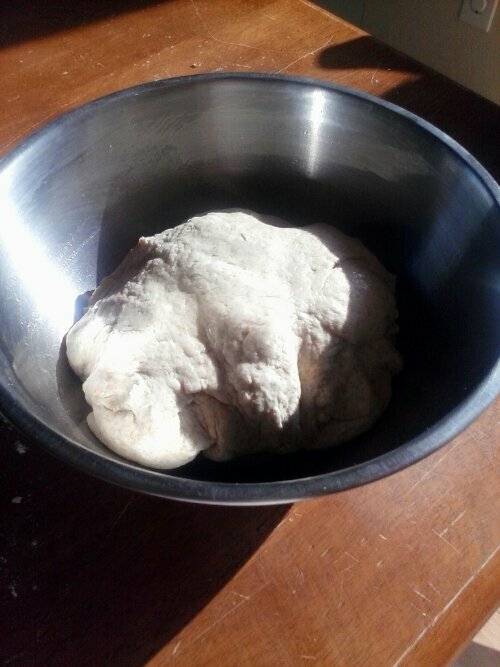 Add enough of the remaining water (it took about another full cup for me) and mix well to form a moist, firm dough. 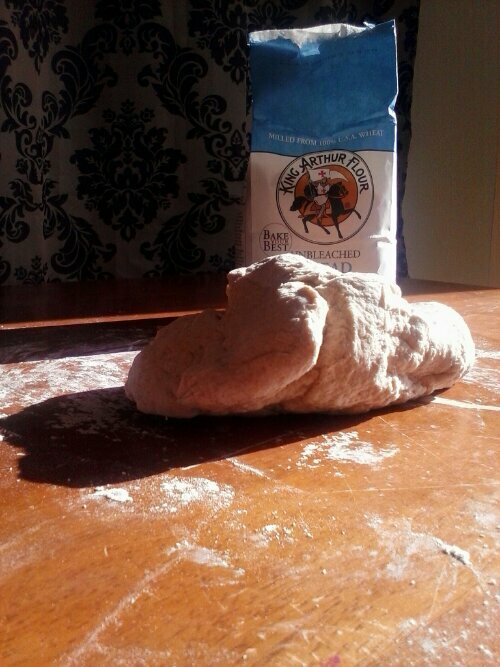 On a well floured countertop, knead the dough for about 10 minutes, being generous about working in additional flour. Your finished dough should be firm and stiff. Lightly brush a large bowl with oil. Add the dough and turn it so it’s coated with oil. Cover and let rise for an hour, until doubled in size. Punch the dough down and let rest for 10 minutes. 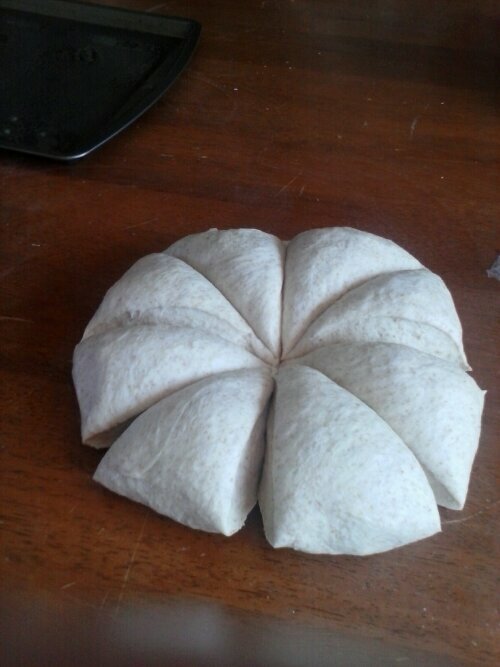 Using a bench scraper or knife, divide dough into 8 equal pieces. Shape each into a ball by rolling gently on the countertop. 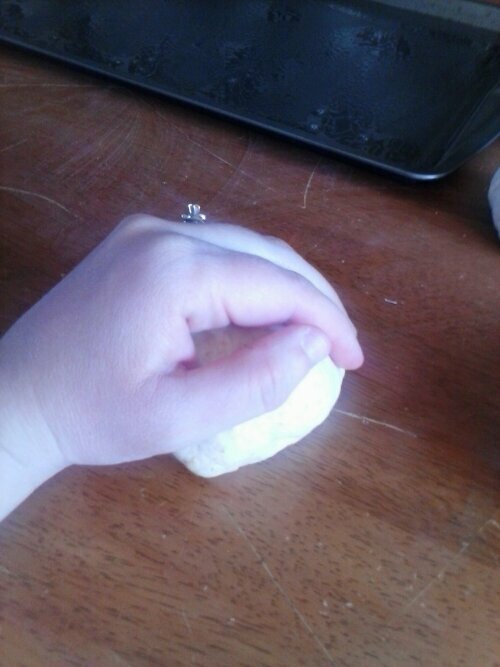 Coat a finger in flour and gently press your finger into the center of each dough ball to form a ring. Stretch the ring to about a third of the diameter of the bagel and place on a lightly oiled baking sheet. Repeat with remaining dough balls. Cover bagels and allow to rest for 10 minutes. *note: use a bigger baking sheet than you think you’ll need in this step to avoid dirtying 2 pans. 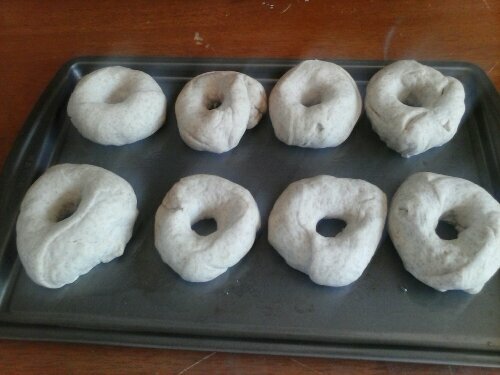 The bagels grow considerably during the boiling process. Mine was 11×17 which was about perfect. Meanwhile, bring a large pot of water to a boil and heat your oven to 425*. When water is boiling, reduce heat to a simmer. Working in batches of 2 to 3 bagels, gently slide into the water. They should float almost immediately. When they do, set the timer for 2 minutes. Turn and boil for 2 additional minutes. Move to a wire rack to drain. Return to the oiled baking sheet. If you want to add toppings, brush the bagels with an egg wash and add toppings as desired. If not, omit the egg wash. Bake in preheated oven for 20 minutes. I actually have 2 for you guys today, both featuring Small Fry. 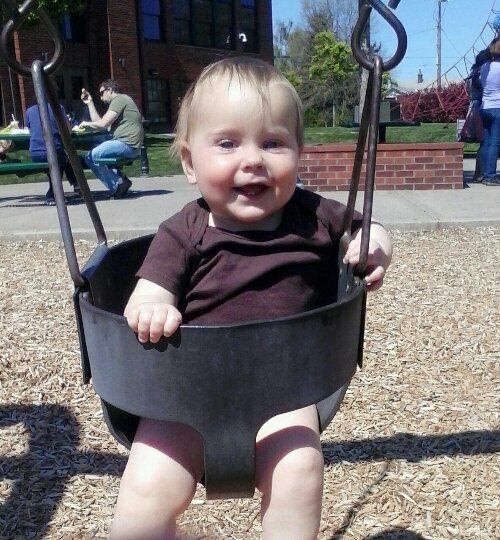 This was only his second time in a swing. Because he was born in July, he was too little to play in one last year, and then it got cold and rainy. 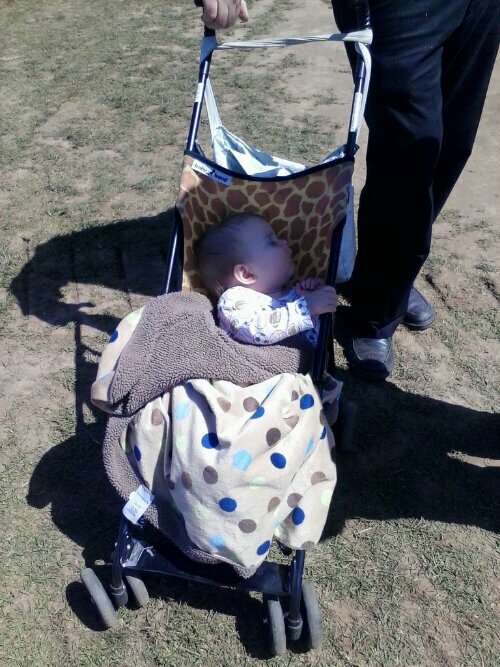 It’s finally nice enough that we can go to the park again :). Last night, we had my brother and sister-in-law over for dinner, along with their two sons. 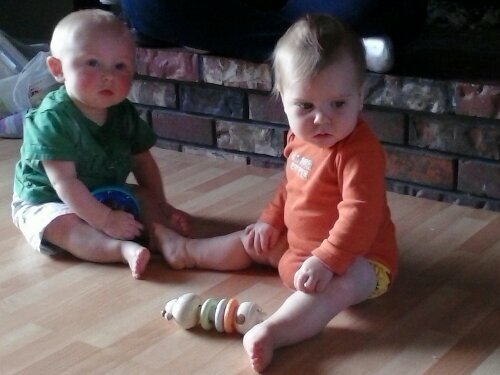 The two babies (Small Fry is 9 months old, and his cousin – though bigger than him – is 7 months old) played together too beautifully not to document photographically :). 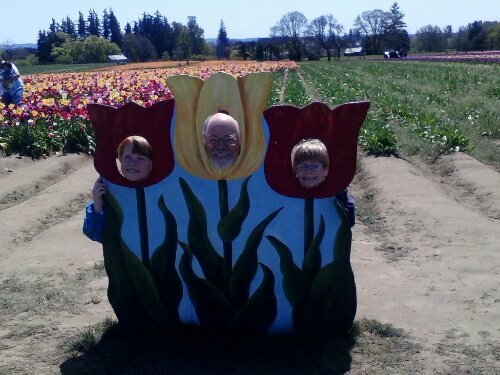 Earlier this week, we joined my in-laws for their annual trip to the Tulip Festival in the town they live in (it’s about a half hour drive from us). 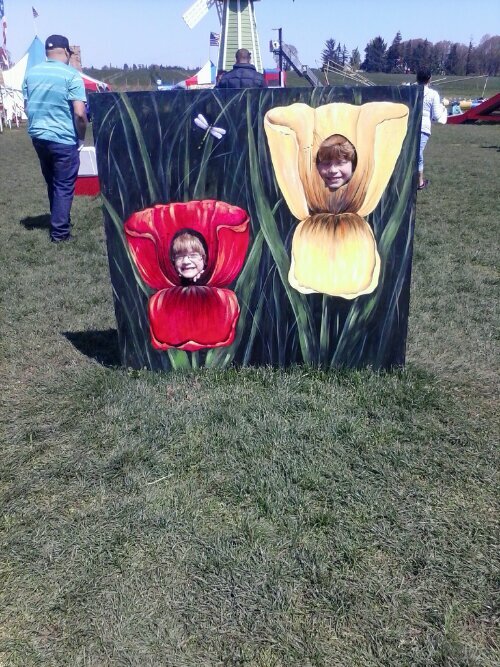 We did it last year and had a lot of fun – even though I was more waddling than walking since I was pregnant with Small Fry at the time – so we accepted their invitation to go again. And then they traded spots since neither wanted to be in the lower one. This was our way of compromising. 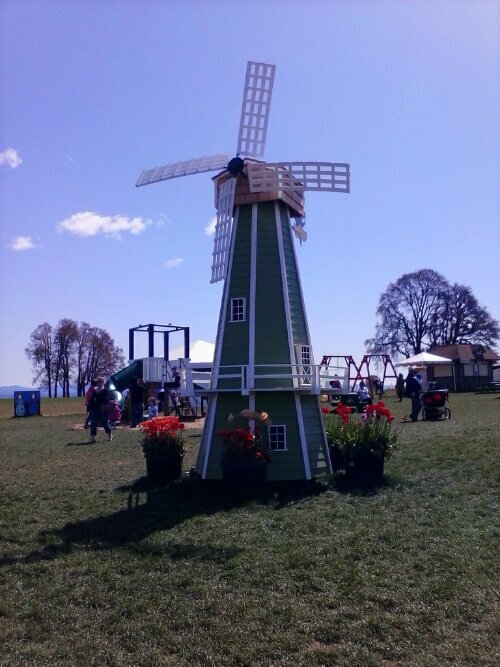 This windmill was in the center of the kids’ play area. 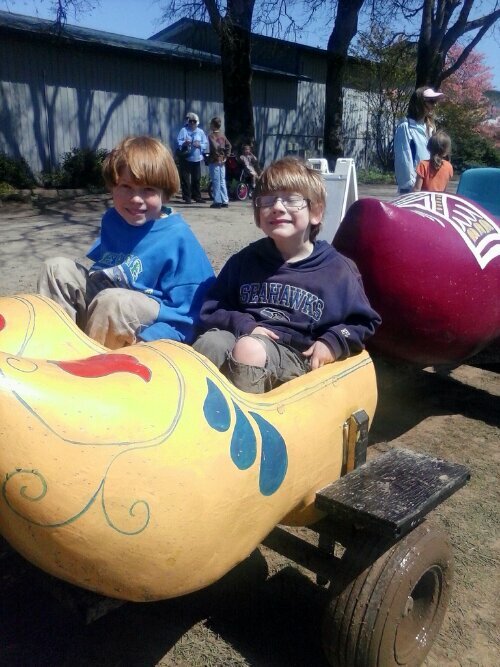 The kids took a ride on the wooden shoe train. 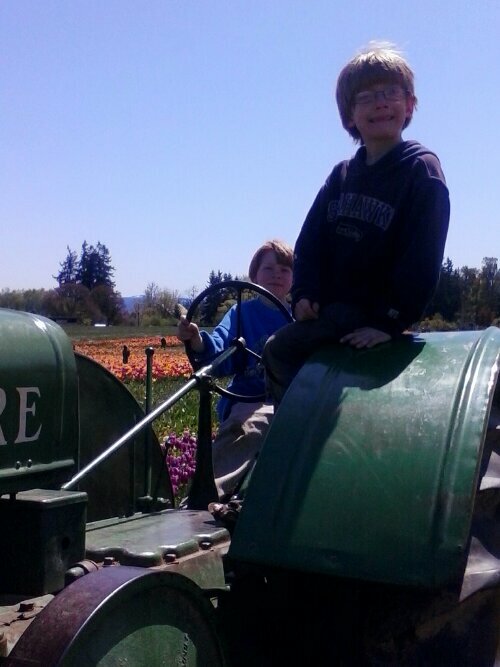 It’s basically shoe-shaped wagons atop tractor wheels towed by a small tractor. 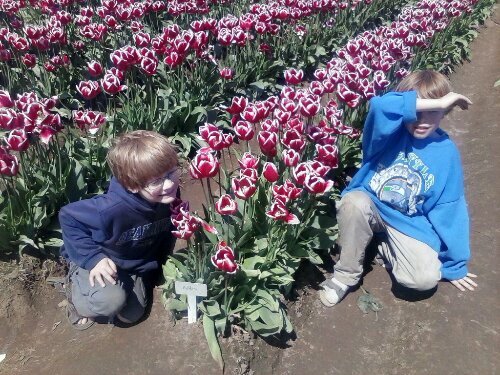 Both last year and this year, the boys’ favorite part of the ride was the “biggest puddle in the world.” Boys! 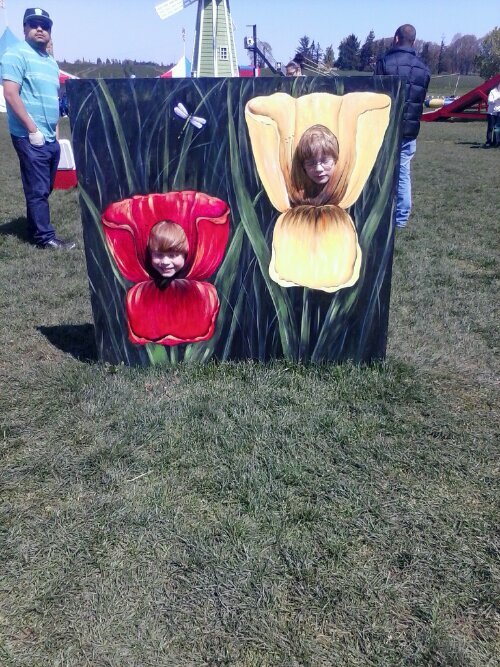 Then we walked through the huge tulip field. I don’t know how many acres it is, but these pictures represent only a small portion of the field. It was too big for Small Fry to make it all the way through ;). Because of the way he fell asleep, he was sporting his very first sunburn later that night. However, because of babies’ Wolverine-fast healing ability, he was all better by morning. 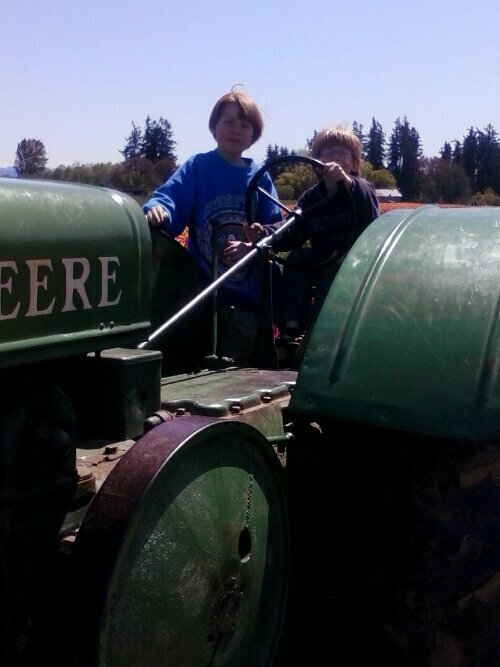 In the middle of the field was an old John Deere tractor for kids to climb on. This is kind of interesting. 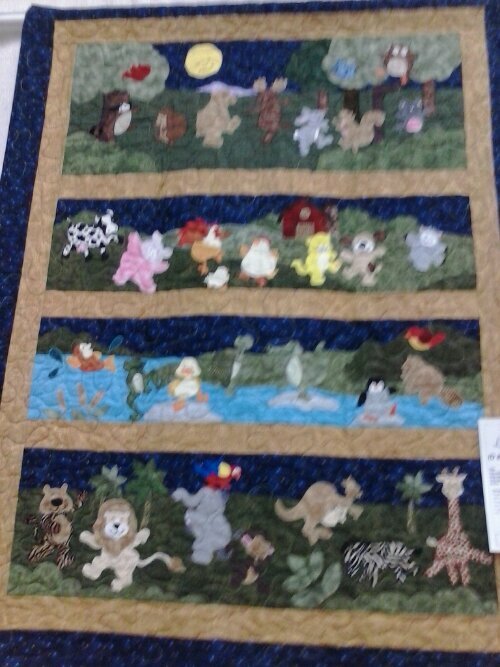 There in the front of the picture you can see that white line… it’s a strip of mesh fabric. 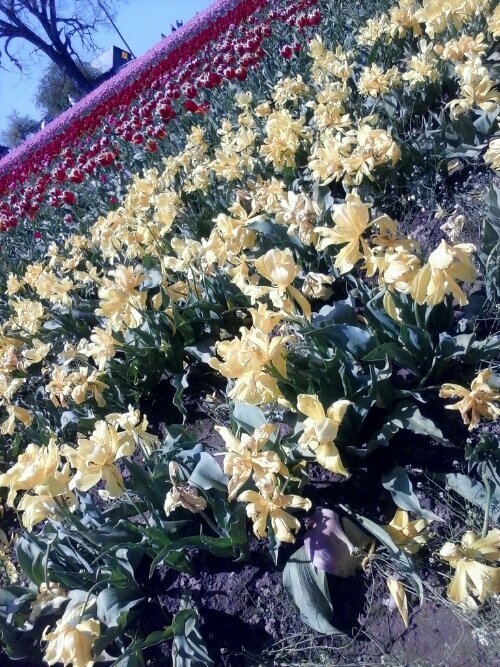 They put those on each row of tulips and then plant the bulbs on top. 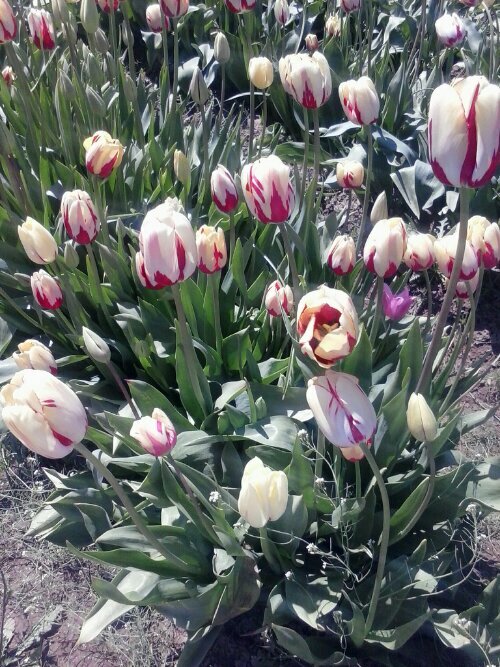 Then at the end of the season, they just pull the mesh out of the ground and the new crop of tulip bulbs comes out of the ground easily without risking damage to them. I thought that was pretty ingenious. 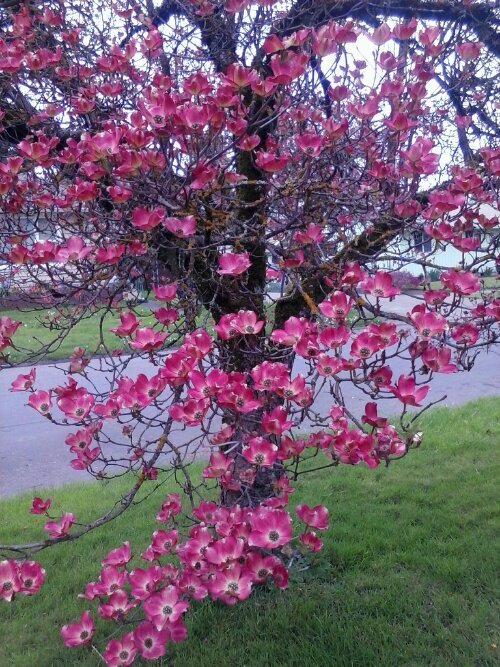 I thought these ones were pretty. 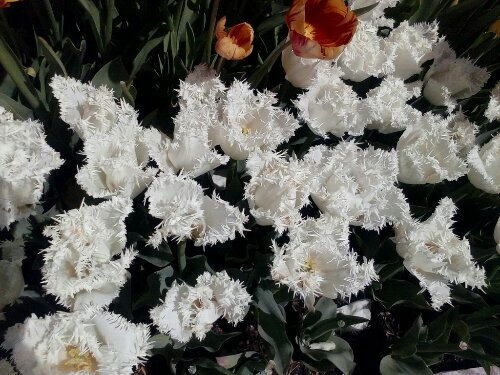 I like the traditional smooth edges to tulips, but I also liked how these ones looked like ripped paper on the edges. 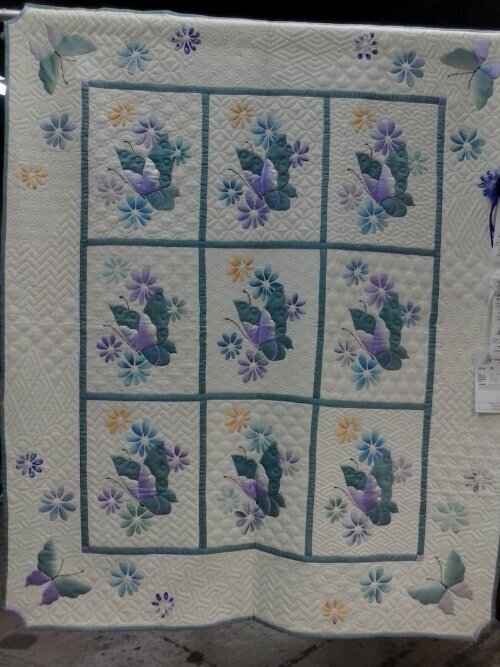 Kind of like the difference between a rag quilt and a traditional quilt. Both are pretty but in unique ways. 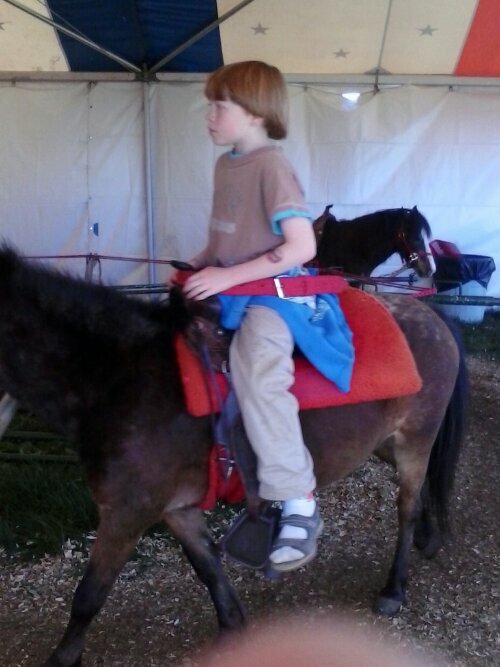 And to end the day on a high note, the kids did the pony ride. Pardon my finger in Munchkin’s picture; I’m still getting used to the new camera phone. 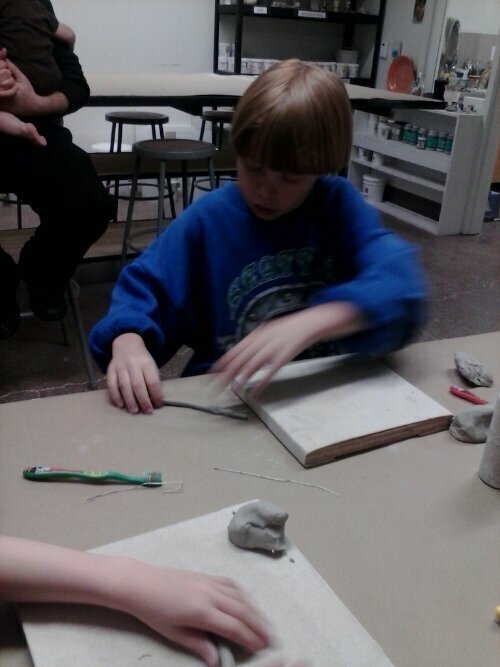 Every Tuesday, my kids go to a pottery class that the local community center hosts. 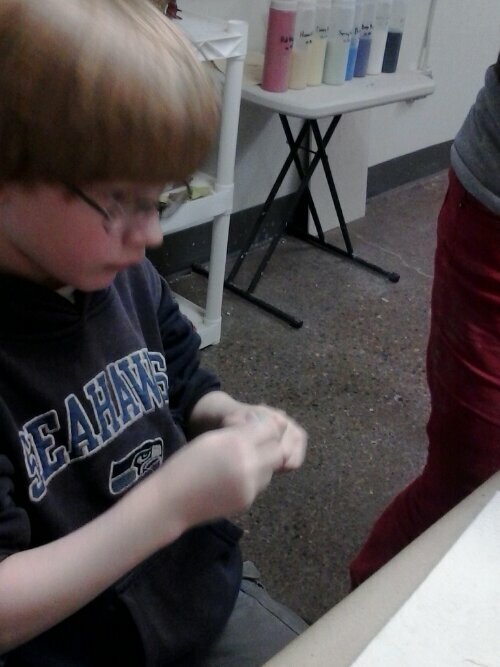 It’s a great way for them to learn a skill and have some fun at the same time. 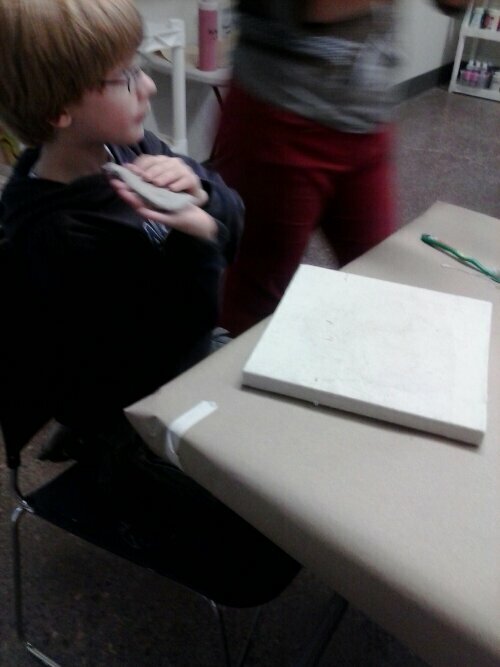 So far, they’ve made a bell, a plate, a cup, and a glazed picture apiece. 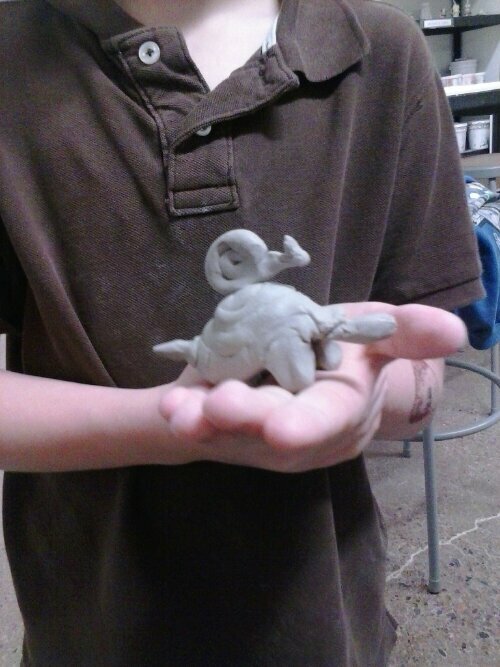 Yesterday, they were making turtles. 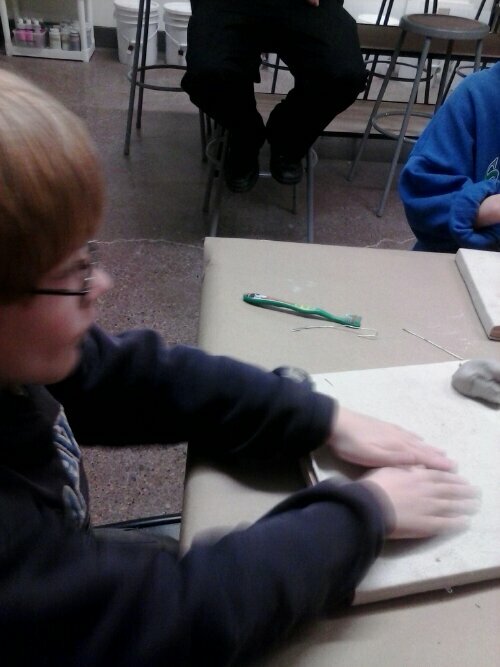 The first step is to slam the clay against the table a few times to get rid of the air bubbles before you start working it. 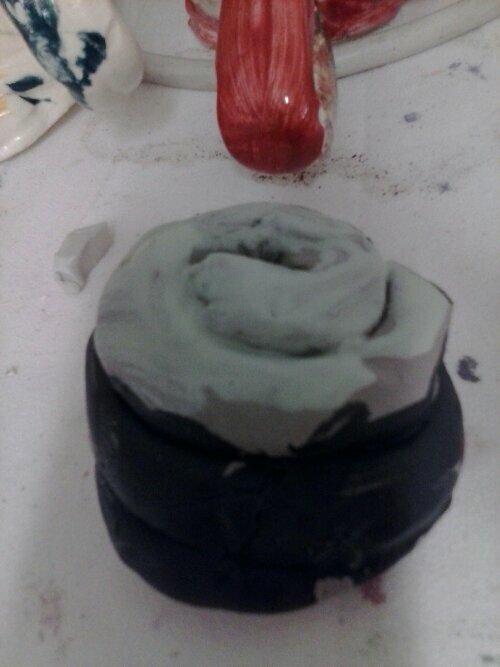 … and then coil the snake into a bowl shape. 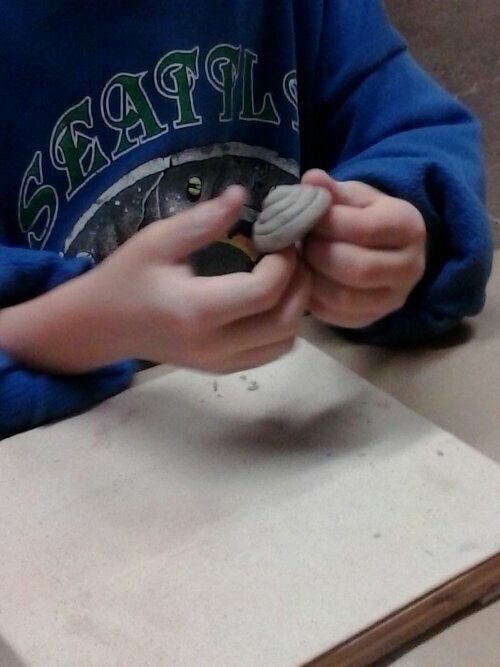 At this point, hubby and I left the boys in the capable hands of the pottery teacher. But when we came back, we got to see their sculpted turtles. The teacher will have them fired, glazed, and ready to bring home in a week or two. The most recent instance of this is the fact that Small Fry, even though he’s 9 months old now, still hasn’t been sleeping through the night. And let me tell you, 9 months of not getting a full night’s sleep is hard on the mama! Our old apartment was only a 2 bedroom, so we put him in our room when he was born; when we moved, we kept him with us even though we have more bedrooms now. 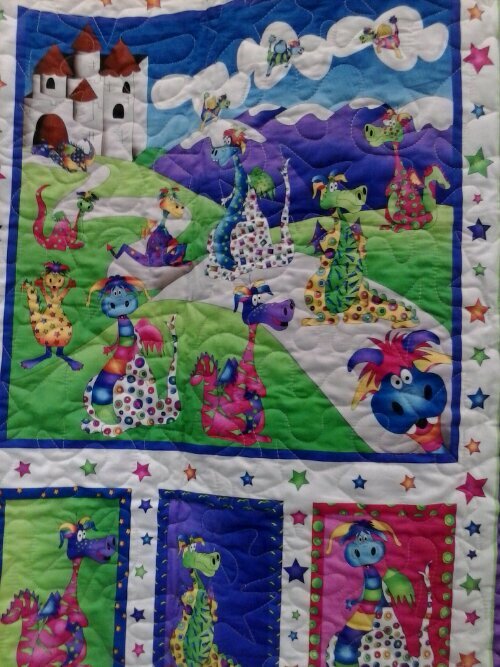 Hubby felt it was more important for me to have a sewing room than for baby to have his own room. What that meant for me was that I got up with Small Fry every time he fussed all night long because I didn’t want hubby’s sleep to be (too) interrupted. Having a baby scream for even 15 minutes in the middle of the night wouldn’t be pleasant for him. Of course, it wasn’t pleasant for me, either, but I didn’t have to work during the days. 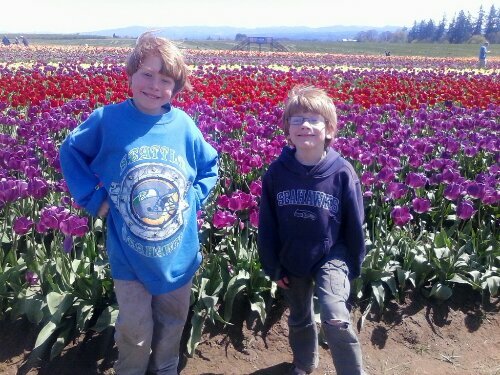 What I didn’t take into account was that to be an effective teacher for Seahawk and Munchkin, I needed sleep too. Well, yesterday, hubby had had enough. He was tired (no pun intended) of having a cranky wife in the mornings. 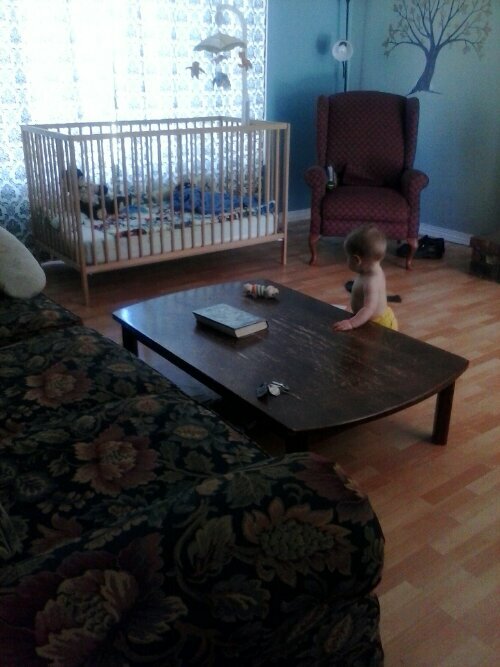 So he dropped the mattress in the crib and moved it to the living room. It’s just there temporarily while we train Small Fry to put himself back to sleep instead of nursing throughout the night. Last night was the first time we made him “cry it out,” and it was a raging success. He cried for about 10 minutes around 1 a.m. and (apparently) for under a minute a couple of other times. I was blissfully unaware of those other times :). Here’s hoping the rest of the week is a smooth as last night and all he needed was for me to leave him alone during the night. 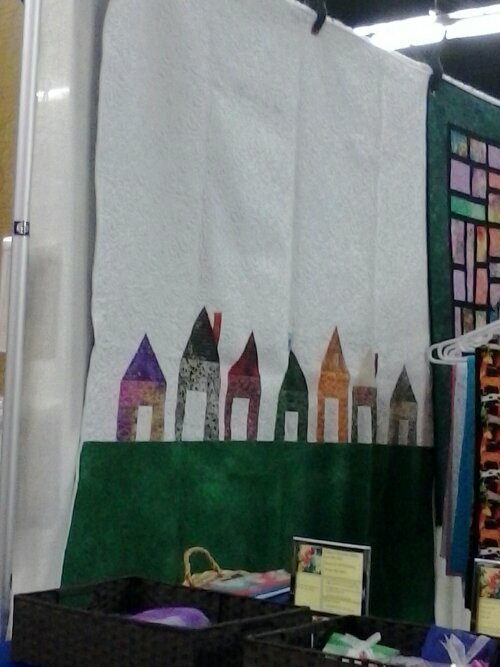 As promised, I’m talking about the quilt show we went to last weekend. 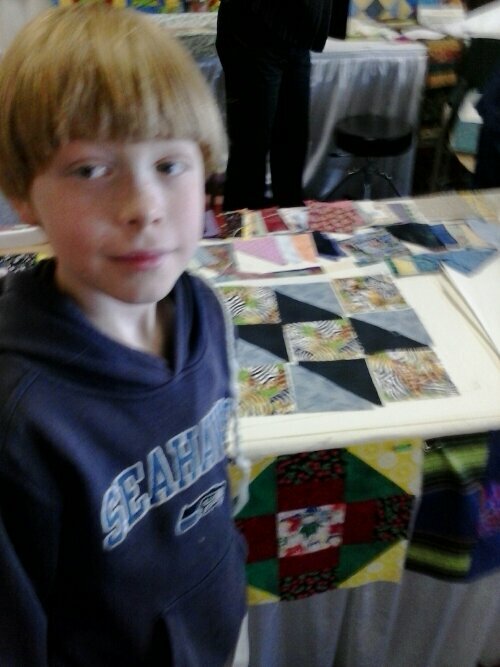 There were hundreds of quilts on display and dozens of vendors. 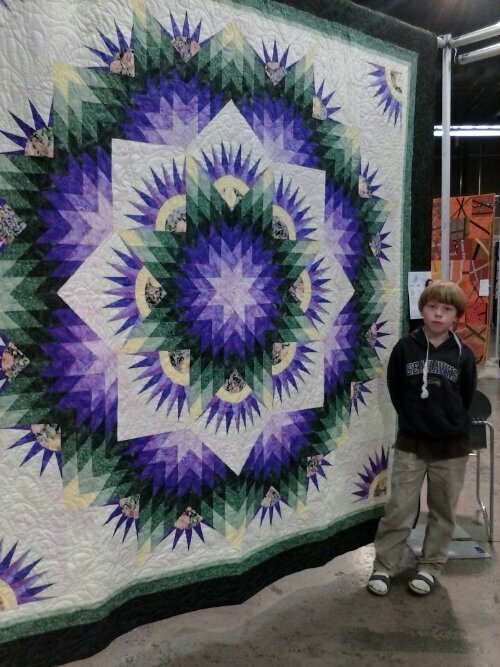 A quilter’s dream :). We started and ended with vendors simply because of the way the place was laid out. This was the most memorable shop of them all. 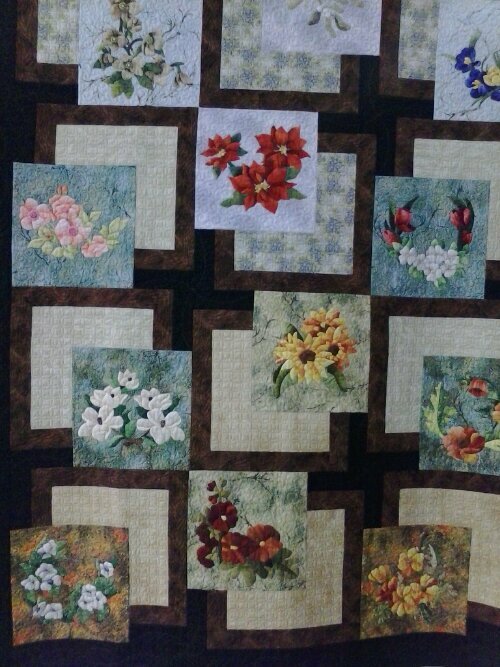 If you look carefully, you’ll see that each of the three appliques are a single piece. 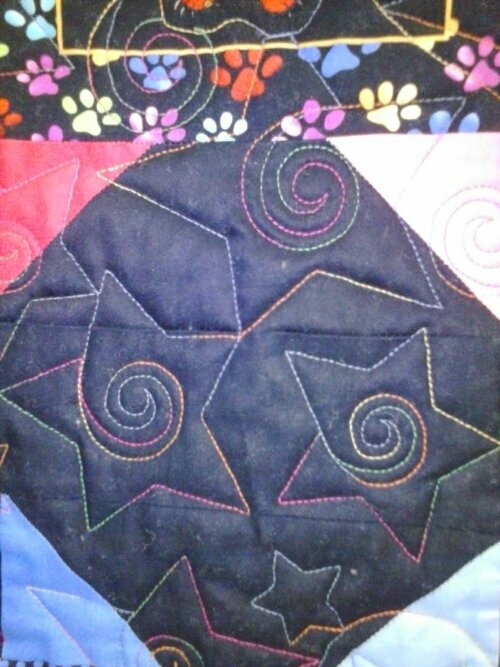 Typically, an applique is multiple pieces of different fabrics (like the Sunbonnet Sues I’m making and will share another day). Because this technique struck me as so different, I snapped a picture of her “how-to” and of an example. This pic is the example one. 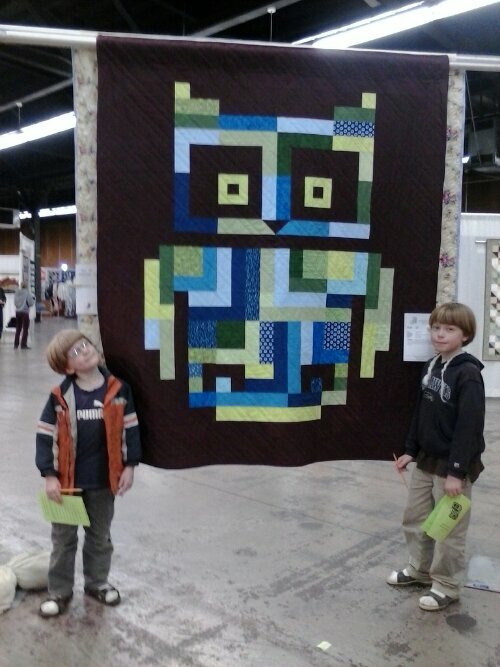 I noticed that owls were a common theme throughout several quilts. This made me reflect on my late grandmother (she passed away less than a year after I got married, long before I had kids). 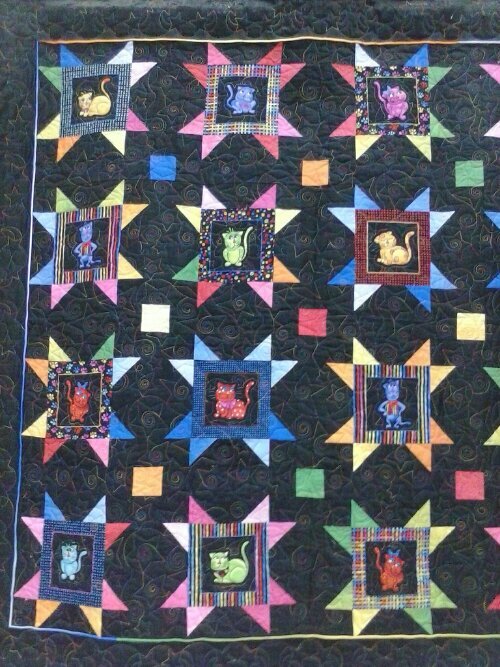 She was an avid quilter and also a collector of owls. 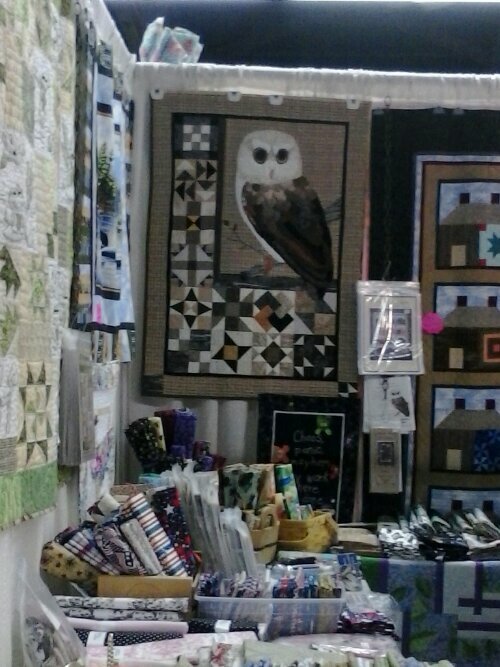 Seeing the owl quilts and remembering her love of the night birds made me wonder if owl lovers also tend to be quilters or the other way round. Or if it’s just coincidence. 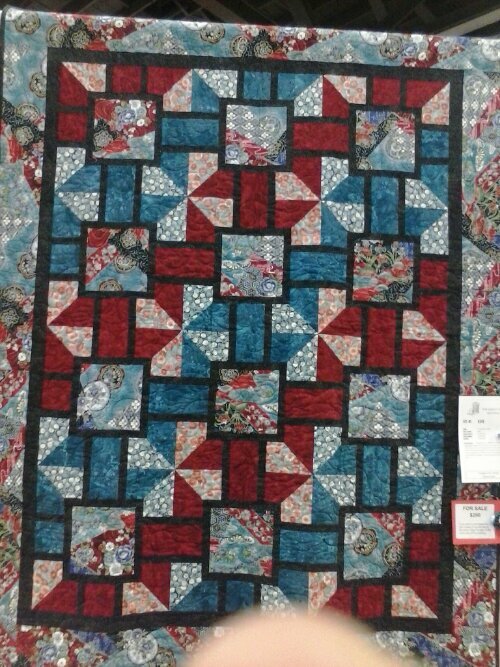 Hubby and I were struck by the simplicity of this one. Very little color, as it’s mostly white, but very beautiful all the same. 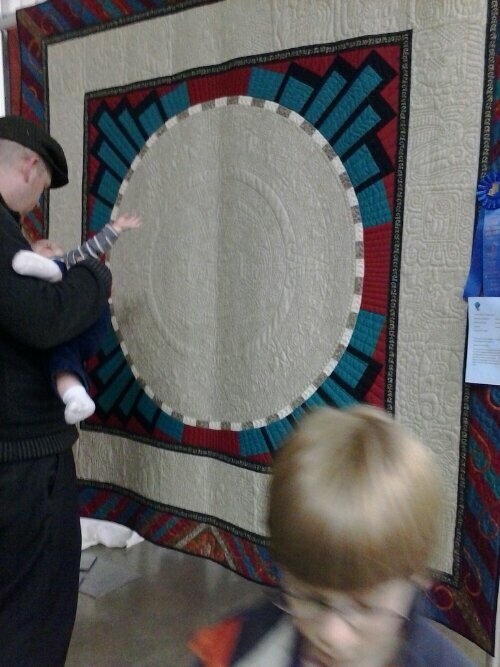 This one was Munchkin’s favorite quilt. He really liked the dragons. 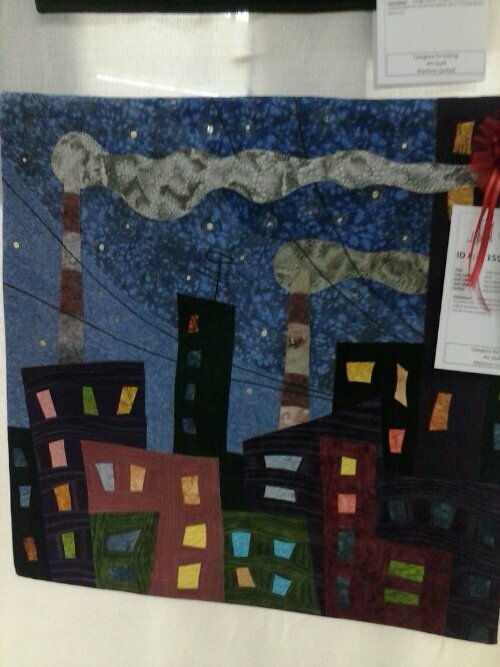 I’m not sure it was my favorite, but I did really like it. 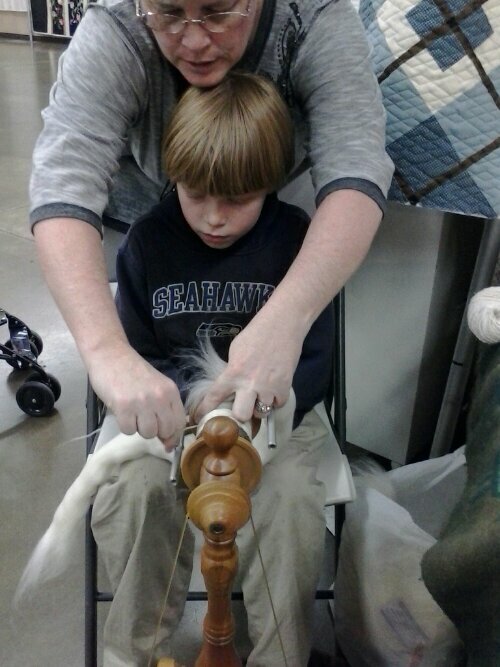 Both of the older kids got to have a lesson in yarn making. This woman was so nice to teach them. And she let them keep the piece of yarn that they made as well as a piece of “raw” wool to compare what they started with to what they ended up with. This one was neat. 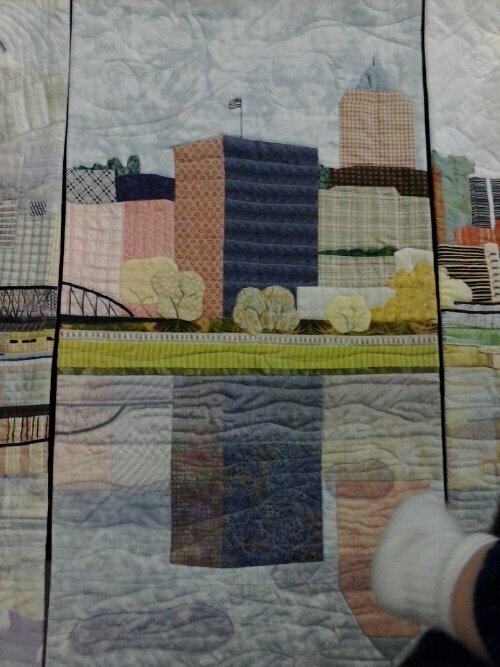 I liked the reflection of the buildings in the water. Upon closer look, you could see that it was accomplished not only with different fabrics but also by layering a kind of netting material over the lower half to mute the colors further. 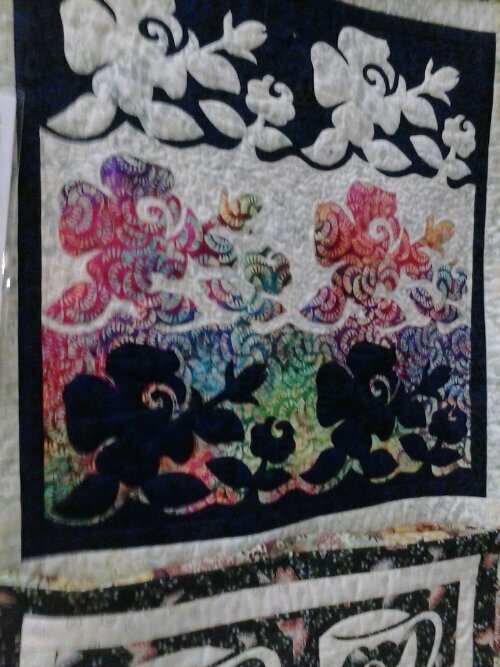 I loved the decorative stitching on this one. And the colors :). Here’s Seahawk with the block he designed. You’ll recall that Munchkin’s was Picture of the Week last Friday. 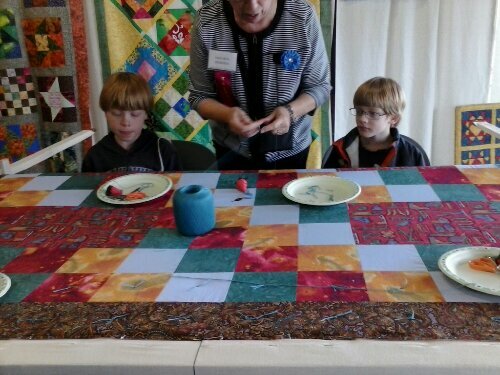 The kids also got to learn the proper technique for tying a quilt (as opposed to sewing the layers together). That’s something I’ve never learned. And I spent the time they were doing that feeding Small Fry, so I still don’t know how! These two were very similar in their construction: both were composed of hundreds of tiny (probably 2×2 or 3×3 inch) squares. 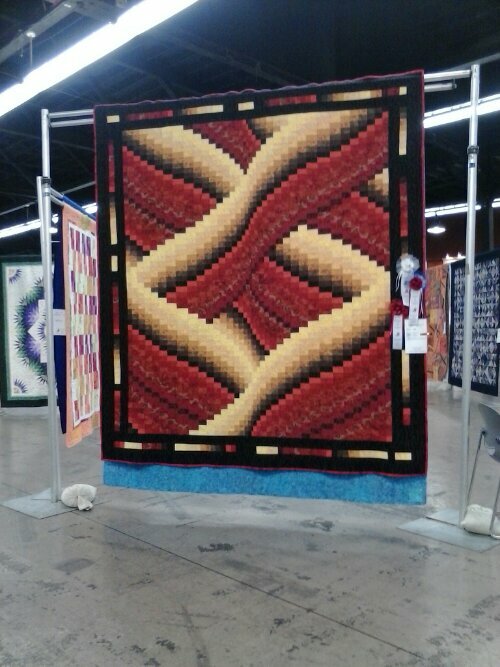 The red and yellow one was hubby’s favorite of the day and my second favorite. 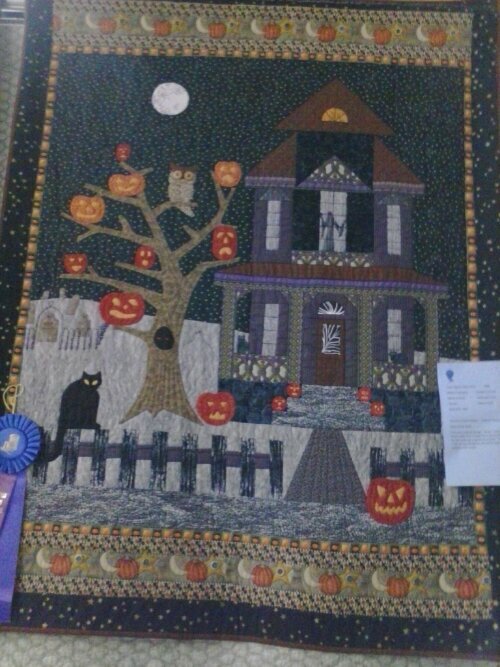 If I remember correctly, it was the blue ribbon winner in the pieced quilt category. Rightly so! These are just several that caught my eye, in no particular order. 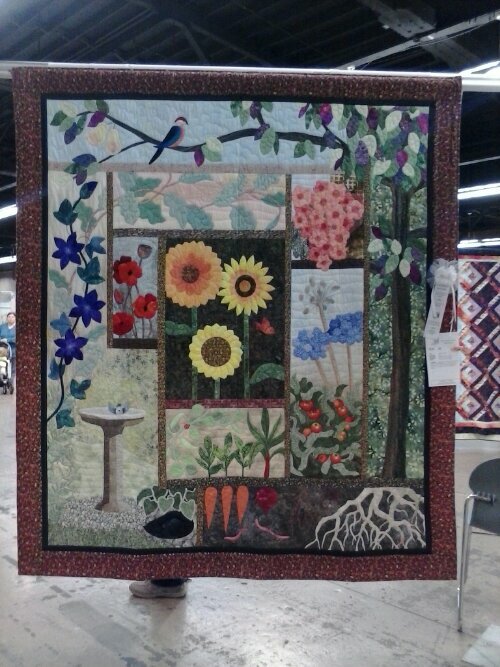 Look carefully and you’ll see carrots and a beet under the ground (that’s my favorite feature of this quilt) and all sorts of other features that cross the framing barriers. 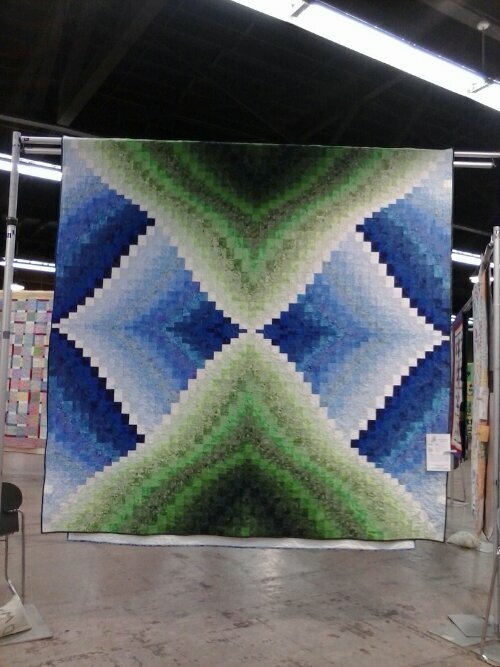 We went to the annual Northwest Quilters’ Expo last weekend in Portland. No one but me was looking forward to it, but once we got in there everyone had a lot of fun. 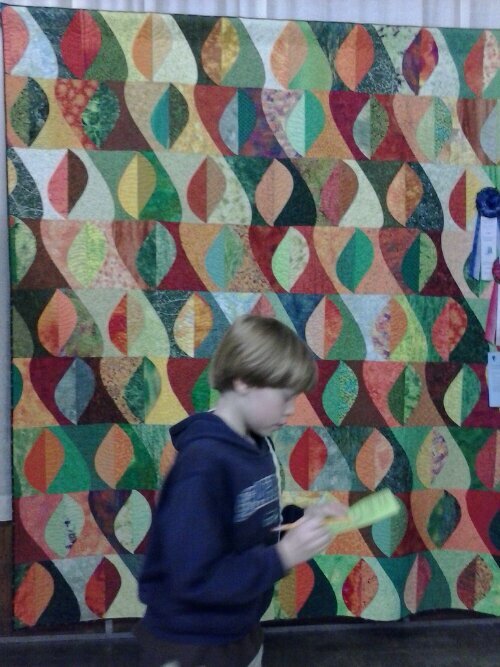 The quilts were absolutely stunning – I’ll try to remember to do a full post on them next week. 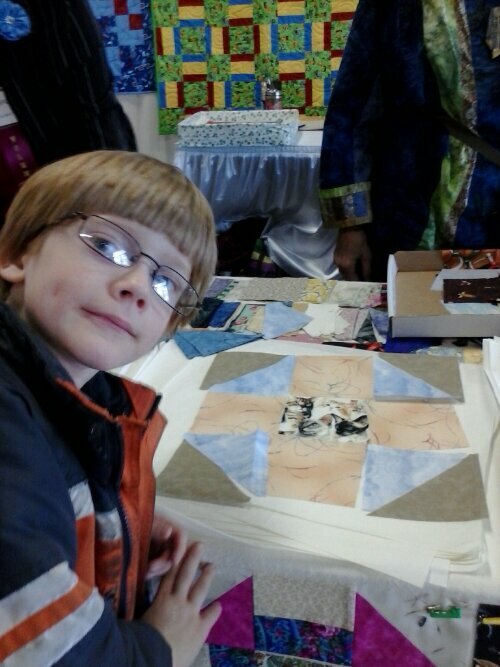 One of the activities they had for kids was to design their own quilt block. 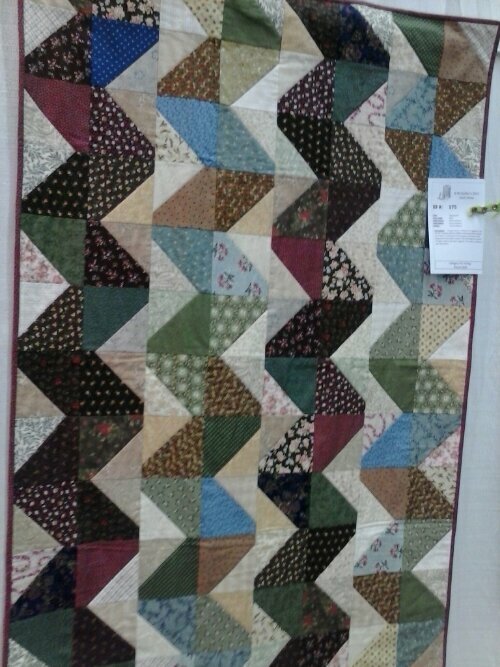 After the expo, they were going to be sending all the blocks to seamstresses to piece them together and turn them into a (or many, I’m not sure) quilt for underpriveleged children in the area. 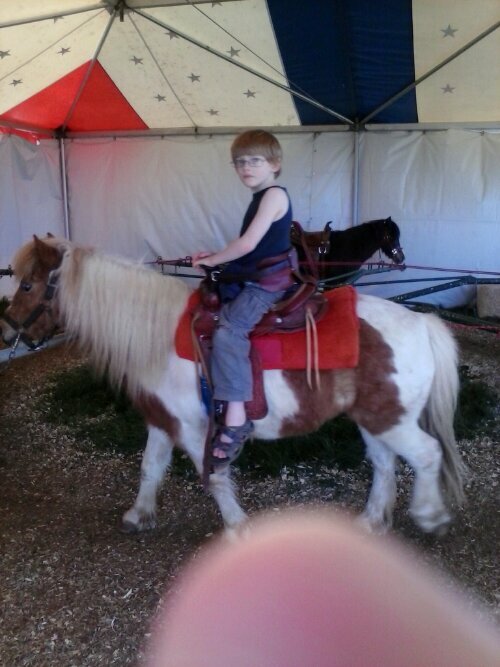 This is Munchkin with his block. What do you think? Did I make it better or mess it up? P.S. 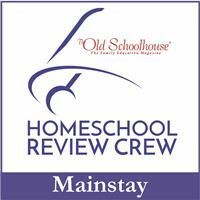 This post is completely from my phone; I wasn’t able to go into hubby’s office this week to use the computer to prep my posts. That’s why I don’t have my usual graphic signature today.